Under contract with MITRE’s Center for Transforming Health. The Cloudburst Group provided technical support for a critical project developing behavioral health quality measures for electronic health records (EHR). For the Office of the National Coordinator for Health IT and the Substance Abuse and Mental Health Services Administration, Cloudburst developed clinical literature reviews and partnered with Technical Expert Panels (TEP), federal partners and MITRE to focus on six behavioral health domains for the EHR, including depression, drug use, trauma, autism, alcohol and suicide prevention. 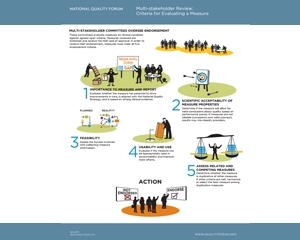 In alignment with the National Quality Forum call for behavioral health measures, a portfolio of behavioral health clinical quality measures was developed to be proposed for inclusion in the EHR incentive program for meaningful use of health information technology. Throughout the measure development process, Cloudburst provided clinical literature scans for all six domains, documenting and evaluating existing clinical evidence of effective tools in primary care and general medical care settings. Cloudburst staff also evaluated clinical evidence of screening, and brief intervention tools for patients who misuse illicit and prescription drugs and alcohol, and clinical evidence for the development of a trended depression outcome clinical quality measure. All clinical quality measures developed under this project will help provide new standards for measuring performance and improvement of behavioral health and health care delivery outcomes.